Today I'm excited to share with you the Shimmer Couture Damask Cardstock from A Muse. The Cardstock is available in a variety of colors. I love using A Muse 8.5 x 11 cardstock to create my cards, because the opposite side of the cardstock is a shiny white, matte white, or cream (depending on the design). It's also perfect for adding just a touch of glam to your projects. Here's a card I created using multiple patterned papers, including the Damask Cardstock in Onyx. 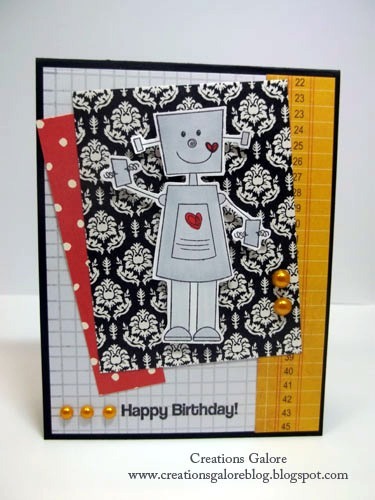 How adorable is that lil robot from Market Street Stamps?! CARD SUPPLIES Cardstock: Paper Cut. Patterned Paper: A Muse, Crate Paper, We R Memory Keepers. Stamps: Market Street Stamps. Inks: Memento Tuxedo Black, Copic Markers. Thanks for stopping by... Have a wonderful weekend! So very cute! Great mix of patterned paper.